A 70-year-old woman presented with chronic ulcerative nodules on her lower extremities at the outpatient clinic. A tender red nodule developed on her left anterior tibial region a month ago, which gradually enlarged; spontaneous ulceration of the nodule and occasional pain were reported. The lesions did not respond to topical antibiotics, and more nodular lesions appeared in the mid-calf area and spread to her toes. Her medical history included kidney transplantation 6 years ago, chronic tinea pedis and onychomycosis. Physical examination revealed multiple firm, 2 to 4 cm, verrucose to dome-shaped, red nodular lesions, with an infiltrative erythematous base on her left lower leg. Some lesions were ulcerated with clear to yellow exudations and crusts. Several small red nodules were also found on the dorsal side of the toes (Figure a). Biopsies were obtained from the lesions and microscopic examination revealed pseudoepitheliomatous hyperplasia and extensive infiltration of neutrophils, plasma cells, histiocytes and multinucleated giant cells in the dermis (Figure c). PAS stain highlighted fungal hyphae inside a neutrophilic microabscess (Figure d). An examination of the lesion scales with potassium hydroxide showed hyaline septate hyphae. Fungal culture grew Trichophyton rubrum. The patient was administered terbinafine 250 mg twice daily for 11 months, resulting in complete remission of the lesions (Figure b). Figure. 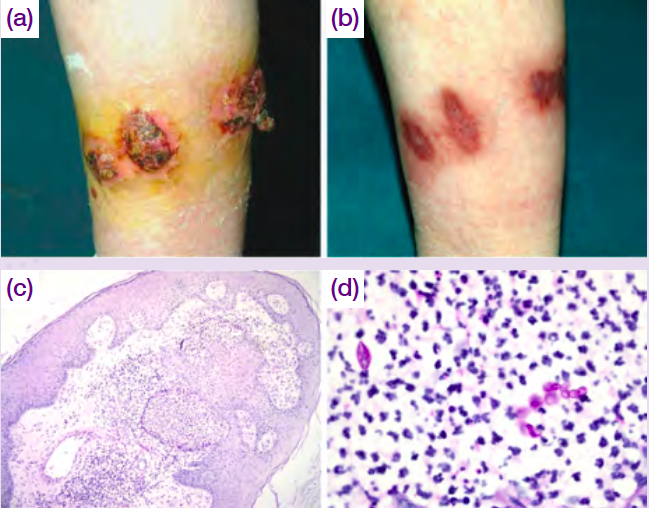 Skin lesions on left lower leg (a) before and (b) after treatment; (c) pathological findings showing extensive inflammation (PAS, x40); (d) fungal elements (PAS, ×400). Su H, Li L, Cheng B, et al. Trichophyton rubrum infection characterized by Majocchi’s granuloma and deeper dermatophytosis: case report and review of published literature. Mycopathologia 2017;182:549-554. Kershenovich R, Sherman S, Reiter O, et al. A unique clinicopathological manifestation of fungal infection: a case series of deep dermatophytosis in immunosuppressed patients. Am J Clin Dermatol 2017;18:697-704. Castro-Echeverry E, Fiala K, Fernandez MP. Dermatophytic pseudomycetoma of the scalp. Am J Dermatopathol 2017;39:e23-e25.